Ariane 5 lifts off Horizons 3e and Azerspace-2/Intelsat 38 satellites. Credit: Arianespace. Arianespace has launched two communications satellites, Horizons 3e and Azerspace-2/Intelsat 38, from Guiana Space Center (CSG) in Kourou, French Guiana. Horizons 3e is owned by a joint venture between Intelsat and SKY Perfect JSAT. Azerspace-2/Intelsat 38 will be operated by Azercosmos and Intelsat. Arianespace CEO Stéphane Israël said: “With this sixth launch of the year, Arianespace is proud to have placed its 100th Ariane 5 mission at the service of our American, Japanese and Azeri customers. 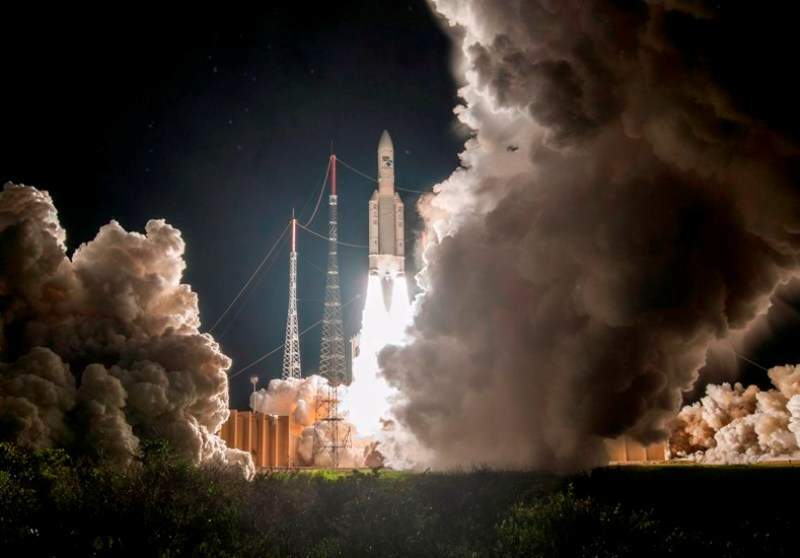 The satellites were launched onboard a heavy-lift Ariane 5 rocket. During the launch, Horizons 3e was installed as an upper passenger and Azerspace-2/Intelsat 38 as the lower passenger of Ariane 5. Horizons 3e, which has completed Intelsat’s EpicNG network, is designed to provide high-speed broadband connectivity to mobile service providers and government entities. Boeing served as the prime contractor of Horizons 3e, which is expected to offer high-throughput services to the Asia-Pacific region and the Pacific Ocean from its orbital position of 169ºE. Horizons 3e is scheduled to provide service by the first quarter of next year. Azerspace-2/Intelsat 38 is a multi-mission satellite that will offer services from an altitude of 45° East. Azerspace-2 is Azercosmos’ second telecommunications satellite and is designed to expand on the current capacity of Azerspace-1. It intends to offer improved capacity, coverage and services to meet the increasing demand for Direct-to-Home (DTH), government and network services in Europe, Central and South Asia, the Middle East and Sub-Saharan Africa. Intelsat 38 is developed to provide Ku-band capabilities and will replace the Intelsat 12 satellite. It will provide Direct-to-Home services for the Central and Eastern Europe and Asia-Pacific regions, as well as critical broadband connectivity for corporate network and government services in Africa. Space Systems/Loral (SSL) acted as the prime contractor of Azerspace-2/Intelsat 38 satellite.